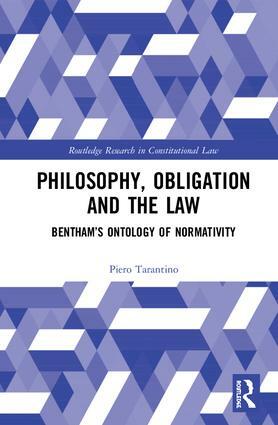 This book presents a comprehensive investigation of the notion of obligation in Bentham’s thought. For Bentham, obligation is a fictitious – namely linguistic – entity, whose import and truth lie in empirical perceptions of pain and pleasure, ‘real’ entities. This work explores Bentham’s fictionalism, and aims to identify the general features that ethical fictitious entities (including obligation) share with other kinds of fictitious entities. The book is divided into two parts: the first examines the ontological and epistemological foundations of Bentham’s distinction between real and fictitious entities; the second part addresses the normative and motivational aspects of moral and legal notions. This book reveals the centrality of the following issues to Bentham’s legal reform: logic, theory of language, physics, metaphysics, metaethics, axiology, moral psychology, the structure of practical reasoning and action with reference to the law. Dr Piero Tarantino is a researcher at Centre Bentham, Sciences Po Law School, Paris, France. This series features thought-provoking and original scholarship on constitutional law and theory. Books explore key topics, themes and questions in the field with a particular emphasis on comparative studies. Where relevant, titles will engage with political and social theory, philosophy and history in order to offer a rounded analysis of constitutions and constitutional law.